Inside: How to create a color palette for your home. Having a defined interior color scheme for your home isn’t as intimidating as it may seem. In this post we go beyond creating a paint color palette and I give you the steps to choose colors that go together to create a cohesive feel from one room to the next. If you’ve been struggling to figure out where to start when it comes to creating a cohesive look in your home you’re in luck because today I’ve got an answer for you and a free printable cheat sheet to help you work through the steps! The best place to start is with color. More specifically creating a color scheme for your home will ensure that one room ties into the next nicely, even if the style of each room is a little bit different. And, creating an interior color scheme, or color palette for your home will make your decorating choices so much easier because it will narrow the amount of choices you have. Why defining interior color schemes is so important. 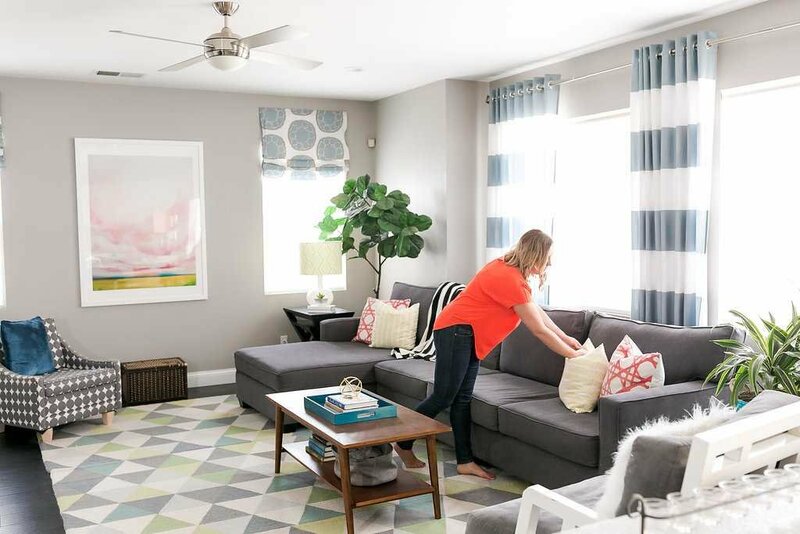 Besides the fact that model homes have absolutely no clutter (or toys strewn about) there’s a reason why they feel so good, and the reason is they use colors that go together nicely and repeat them throughout the home. Now I’m not saying that I strive to have a home that looks like a model home –cause that isn’t real life, but I will say that when I started thinking about creating a color palette for my home, I definitely took cues from model homes. And it just so happens that touring model homes is one of our favorite weekend activities. Free cookies for the kids, and color scheme ideas for me, a win-win! In model homes there’s typically a whole home color scheme that’s carried throughout the house, but instead of feeling boring, it feels good and flows so well! Well, they use a limited number of colors in their color palette, but use them in different ways in each space, creating a home that flows from one room to the next. And even if the style varies a bit from one room to another, the colors connect each room. This is especially important in homes with an open concept floor plan. When we’ve chatted before about what your biggest struggles are when it comes to decorating your home, most of you mention color. More specifically, that it’s difficult to decide on an interior color scheme and you don’t know how to choose colors that go together. Having a defined color scheme for your home is going to help with all three of those things because you’ll have chosen colors, which will give you a starting point, and that will automatically limit your choices. Your decorating style will suddenly become focused! How does that sound? When we first moved into our home I knew I wanted a warm grey as our living room paint color and started looking closely at color scheme ideas. But choosing colors for your home can be really overwhelming so I had to come up with a process that would ensure I had a unified color palette, and would be able to use my decor in more than one room. Print your free color palette cheat sheet to organize your ideas as you go through this post. Just enter your email address below and I’ll send it to you right away! The colors you use in your home are completely up to you. Do what makes you feel fabulous cause no one ever gets sick of that right? Stick to 3-5 colors for your interior color scheme. For those of you who love color, this may feel limiting, but I promise you’ll still end up with a colorful home. For those of you with a fear of color, go with more muted shades of color so that you add color into your life without it being too in your face. Remember, we’re not talking about redoing your entire home tomorrow. We’re talking about defining your interior color scheme so that over time it will guide your decorating decisions and eventually you’ll have a beautiful home that’s totally you and has a cohesive look. Questions To Ask Yourself Before Choosing Colors For Your Home. Starting with your favorite color means that you won’t be getting sick of it any time soon. Now I’m not saying that if your favorite color is cobalt blue to go paint all of your walls that color, but you can most definitely use it as a starting point. The point is, color evokes emotion. So think about places or views that make you feel awesome and start to notice if there are certain colors that you can bring into your home that will give you those same feelings. What colors are you already stuck with? 99.9% of us aren’t on an unlimited budget which means that we’re always trying to figure out ways to work with what we already have. So think of things like already existing furniture, cabinetry, counter tops, and flooring. What colors are already in your space and what undertones do they have? Figuring out undertones when looking at these things is a lot like what we talked about when choosing paint colors. You want to look at the color and decide if the base color has red, green, blue, brown, or yellow. >> To learn more about undertones click to this post. Do you want your home to feel calm and spa like? Or lively with lots of contrast? Or how about uber modern? Your color palette will help achieve the feeling you want. Ok, now don’t get scared. I’m about to share a tiny bit of color jargon with you. It’s necessary to get you going in the right direction. If you’re afraid of color, or want your space to feel modern and clean you’ll probably want to go with a monochromatic color scheme. If you’re going for a calm or relaxing feel you will want a harmonious color scheme. Harmonious colors are next to each other on the color wheel. They go together because they’re essentially made from each other. If you love high contrast and lots of lively color you’ll want a complementary color scheme. 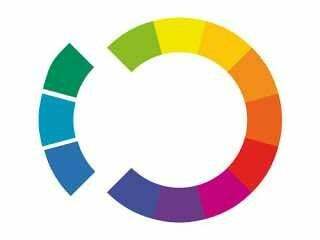 Complementary colors are opposite from each other on the color wheel meaning they contrast each other. Each color stands alone. Ok. Now your ready to start creating your own interior color scheme! Keep in mind that this is just a guide. If you have cabinets that have an orange undertone, but love blue and still want to create a spa or beach like feel, you absolutely can. I mean mother nature does it right? As you can see from the examples above there are many different ways for you to use colors that go together. Color 1: Pick a white. This white will be your go to color for trim, doors, the insides of closets, and maybe cabinetry, and painted furniture. Be warned, not every white is the same. They may all look white in the paint aisle, but just like every other color, whites have undertones that you will want to pay attention to. You’ll want to choose a white based on the undertones in the items like cabinets, flooring, and furniture that you are stuck with. and are going for a harmonious color scheme you’ll want to choose a white with a touch of yellow in it, or a barely off white. and are going for a complementary color scheme you’ll want to choose a white with a touch of grey or blue in it. A cool white. Color 2: Pick a neutral. This will be your go to color for walls that connect rooms like halls, and open living spaces. Neutral does not mean tan or beige. Color 3: Pick one saturated color. This will be the starting point for the rest of the colors so like we talked about before, go with a color you love. Keep in mind that this doesn’t mean that this will be a color that is necessarily on your walls. We’re talking about a whole home color palette, so this is just going to be a main color. If you love color this probably won’t be hard for you to do. If you’re a bit fearful of color don’t worry. When I say choose a saturated or bold color that can be a lighter shade of the color. For example, I love this deep blue. But on the walls a dark color like this can be difficult. So I move a few shades in on the color swatch and find another great color. A variation of the same deep blue that I love. Color 4: Pick another color. If you’re going for a monochromatic color scheme this color will be a lighter shade of color 3. If you’re going for a harmonious color scheme this will be a color that is next to color 3 on the color wheel. It doesn’t have to be the same intensity. 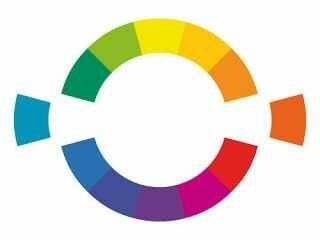 If you’re going for a complementary color scheme, go to the color wheel and find color 3. Then move directly across the wheel and choose that color or one up or down from it. Color 5: Pick an accent color. This will be the accent color in some spaces but may be the main color in other spaces. Since you’ll be using this color palette in your whole home, the colors you choose will be used in different ways in each room to keep it interesting. Most of the colors in my home are probably considered monochromatic. Lots of blues and greys. But the accents are definitely complementary to add that pop of color I love so much. I keep this from feeling too kid like by picking colors that are bright, but sometimes muted and definitely not primary colors. Now that you have a color palette, it’s all about using the colors (or variations of the colors) you chose differently in each room. That’s right. You don’t have to stick to those exact colors. Remember this is just your guide. Going up or down a shade or 2 to make it work in the space you’re doing is great. The idea is to stick to your color palette as a guide. In my family room I use variations of my neutral greige throughout. My main color is blue but I don’t stick to just one shade of blue, I use a few different blues and even some teal. Then the pops of color come in with some light lime greens and yellows and very small pops of pink. In the same room, we created a large built in and I made it pop by painting the wall behind it a variation of my blue so it was darker . Then I added a few pops of my yellow and pink in the accessories. The family room room opens up to the kitchen, so to bring a bit of the same colors over here, we did a light blue glass tile backsplash. Again, I use variations of blue sprinkled theough the space. Everything from turquoise, to deep saturated teal is fair game. This is the first room you see when you walk in the house and it’s definitely the lightest and brightest space with lots of blues and white. This room has definitely changed a lot since we moved in and although it is a bit more coastal than other spaces in our home the color palette ties it in with the rest of the house. My dining room is currently in transition but this gives you a good idea of what it looks like. Same subtle colors with pops of blue and teal. Don’t be afraid to use your colors in unique ways like painting an accent wall or a piece of furniture. As long as the same colors or shades of those colors are popping up throughout your home you’ll have a continuous look, even if the style of the furniture varies. My home is still very much a work in progress, but now that I have created a color palette it limits my choices and creates flow from one room to another. I’m looking for a color palate cheat sheet. Hey Joe, you’re in the right spot! Just scroll up underneath the first image on this page. You will see a blue rectangle with the header “Free Printable Color Palette Cheat Sheet” enter your email in the box, and click “Yes Please!” Then check your inbox for an email with a downloadable link to the cheat sheet! Hi! What would be compliments toa robins egg blue. I love that color but dont want it everywhere. Hi Daisy, it really depends on what type of look you are going for. If you want a “wow” effect, go with blue’s opposite on the color wheel, which is shades of orange. For a more soothing tranquil look, blue pairs well with varying other shades of blue and neutral whites. Best wishes! I loved this post. I’m just starting out to work on my apartment I’ll be moving into shortly & excited and afraid of choosing the right colours and tones. Looking forward to going through your other posts as well. I want to paint all of the interior doors and trim the same color ( light grey or greige) and use differing depths in different rooms. How do I get started. My home faces east and we don’t much sunlight. Its an older home and not too many windows. I don’t want it to feel like a cave, it needs brightening on the inside. Hi Sarah! If you’re wanting to brighten the space definitely go with a cooler undertone in the grey or greige you pick and keep it pretty light. As for the trim you could do a white for the contrast that way you don’t have to go darker on the walls to get the contrast. Hi – where was your (fiddle tree?) plant from? I love it!! Thanks!! Hi Angela! My post The Big Secret About My Fiddle Leaf Tree tells you all about it! Can you give the paint names/color numbers for the paint collage in this post? The one with five tiles: gray, teal, turquoise, limon, and bright coral? Many thanks! Hey Robbin, Those aren’t necessarily paint colors. They are my color palette though. But to give you an idea the grey on my walls is Requisite Grey, turquoise could be Cooled Blue, teal could be Briny, yellow could be Eye Catching, and pink could be Heartfelt (all Sherwin Williams colors). Hope this helps! If the pieces are right next to each other and have opposite undertones it’s a good idea to add separate them somehow. For example if a wood dining table with cool wood undertones sits on a wood floor with warm undertones separating them with a rug lets each piece stand on its own and reduces the impact of the contrast. The rule of thumb is to keep like pieces together. Not saying to match exactly but keeping the undertones or the grain or texture similar within a space is a good rule of thumb but you could go in a different direction in another room. That said, adding a buffer like the example I started with or making sure that the pieces are far apart will work too, but try to have each piece have a buddy in each space so it looks intentional. Our house was flooded by Hurricane Harvey and we are starting from scratch. We are in the painting stage now. We painted the den “man cave” Big Chill by SW. I am just not sure I want Big Chill through out the entire house like I originally planned. I am having a problem now with what trim color to use if I go with a warm greige in the rest of the house. I really didn’t want stark white cabinets & trim, but Big Chill looks the best with Pure White or Extra White from SW. Does my cabinets have to be the same white as the trim or can I have an off white on cabinets and brighter white on trim? My house is not an open floor plan. Den & Kitchen on one side and stairs in the middle with living room and master bedroom on the other side of stairs. Hey Marlene, so glad you’re getting your home put back together. Your cabinets don’t have to match the trim but I wouldn’t go too yellow with your off white cabinets if you’ve got bright white trim nearby. Since your home isn’t an open floor plan the colors don’t have to flow in terms of the sightline, but they should still flow enough from one room to another in the main living/ main use areas. Best wishes! Great article! We are moving from our gray contemporary to a brown traditional, and will be looking for ways to make our new brown traditional more our style. A question about tray ceilings. What do I do with them? I’d like to highlight them but not sure the rule of thumb with colors. Is there a certain order of painting different shades on tray ceilings? Suggestions on how to do this? How exciting about your move, Jill! It’s a great opportunity to experiment with decor changes. I don’t have a specific blog post about tray ceilings (but it’s a great idea for a future post! ), but I found a resource that should answer your questions. Good luck! Hi Corey, I am struggling to come up with colors, could use a little advice. I am using Sherwin Williams paint. I can send a photo of the master bath but the rest is a blank canvas and starting fresh with decor. Have a few pieces that are neutral to fit in. We have a 4 bed/2 ba. The master bath tile is tan mix of light and dark tones in it. The color in the bath is 9102 quinoa, then the master bedroom I want a blue, (has a tray ceiling too, should I paint part of the ceiling?). I like grey/blue or just blue. 9145, 46, 47 or 48 with one wall quinoa (where bed will be) then do I just use trim color in my closets? Trim choice is 7009, pearly white. hallway #0055 light french gray, family room & kitchen (cabinets will be white, & countertop white, black & gray) want to continue light gray but do #7673 pewter cast on one wall in the family room. The flooring will be a mix of light & dark plank flooring. That seems to go with all my colors. I have a gray & white area rug to use in there. The other 3 bedrooms, (2 offices). Guest room & guest bath. I have a really awesome mermaid I got from a local artist, not sure if I am going to put it in the hall or the guest BR, but for now thinking quinoa but may want a blue in the guest room if I decide to make it a mermaid beachy theme. I am concerned too much tan, guest room, bathroom and office are all side by side. I like the blues light or dark but not any purple or green tones. This is really hard for me to nail down and make a decision and stick with it. sorry to be so long, I hope you can offer some advice. Hey Andreina! I can’t give specific paint color advice since I can’t see your home in person. You might find these tips helpful. I suggest you buy paint samples first. Paint a few brush strokes on the walls (or on boards if you prefer) and look at them at different times of day, under different lighting. Doing samples first lets you see how everything looks together and gives you a better chance at getting it right. Best wishes! I have many shades of warm beige/tan colors in my home. Do these count as colors because they are actually neutrals? I love your site, specially this article. Can I translate it to Persian, for my followers? Surly I will say your website link. Thanks Maral. I’m so glad you like the content, but no you may not translate and use the content or images. It is not good for a site to have duplicate content out there and can harm my rankings with google. I do appreciate you asking. As many others have already said, this is a great article, and you have a fabulous website! I’m wondering how to incorporate woods into the color scheme (for instance, I noticed that you have medium-tone “orangish” wood accents in your home, but orange is not in your color palette. Any suggestions? Thanks Denise! Since woods are a neutral/ natural accent they aren’t in my color scheme but you definitely need to consider them. Here’s a little example… if you have orangish oak wood and you want to make your space more modern you will want to pick colors that DO NOT have a yellow or orange undertone to go against it (contrast.) But if you want to go more classic or even traditional you may want to go with some warm undertones in your color scheme. Hope this helps! I’m closing on a new house in a couple weeks and have been driving myself nuts trying to figure out the color scheme (I’m reprinting the entire house). Your articles are very helpful and encouraging! I want a good cool gray as my neutral and I lean toward blues and purples. Is it still ok to do a pale yellow up the stairs and in the upstairs hallway even if I’m doing most of the living space downstairs a gray? Also, what’s your recommendation for a really good cool gray that is dark enough but not too dark? I’ve probably got 100 gray paint chips and I’m losing my mind!! Thanks so much! U should do fuschia as your pop of Color! Your home is gorgeous! 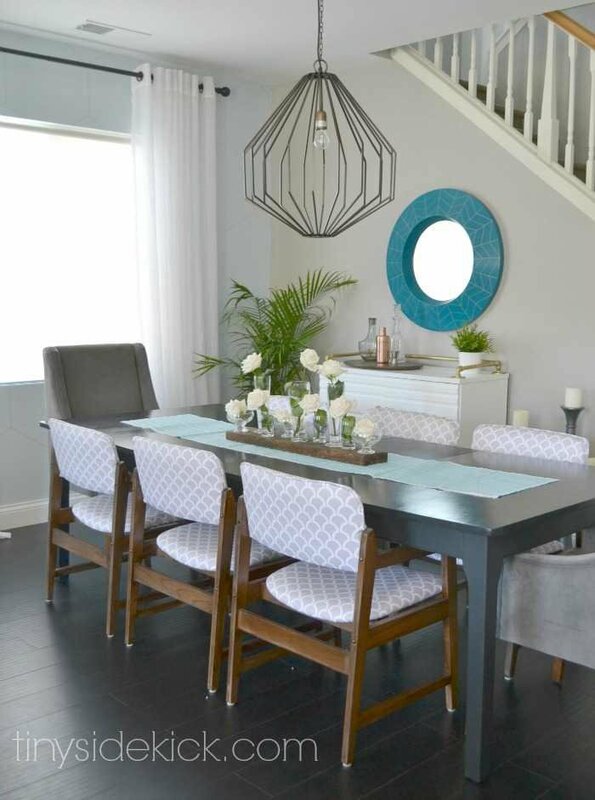 I am having a hard time deciding if I can decorate around our formal cherry dining table mission style and our rusty colored couches and still go gray? You sure can Cindi! It will add an instant dose of modern to your space. Grey goes with everything! Can you help figure out a color scheme??!! Or at least a main color to start with? I can figure out the accents/pop color(s) I’m having the hardest time deciding on the main color. I have a craftsman home (built in 1911), with beautiful stain wood trim. Right now my walls are bold with historic color/contrast. The walls in the main rooms are like a mustardy gold (sounds horrible I know- but I liked it 7 years ago when I painted them this color!) above the trim (there’s cut off trim about a foot down from ceiling), I have a Mother Nature green in living room, and a earth red in dining room (again above trim, below ceiling) and my kitchen has white trim, earth red walls above white bead board walls (which are bottom half of the walls), the kitchen cabinets are an antique white. Soooo I’m wanting to go neutral GREIGE, throughout the house…can’t decide if I want a darker greige on kitchen cabinets or white…I’m also concerned about the greige color with the wood trim (it is a dark cherry stain) I need the perfect color of greige!! I want to transform my house to have a fresh, light, clean, airy, uniform feel to it. There are six of us in this small but cute and cozy 1000 square ft house! Any help/advice would be greatly appreciated!! Hi Gina. I don’t have any articles specific to working with wood trim, but I do have a post that has some great colors to start from. It is right here if you want to take a look. before buying, but rug selections in stores are much smaller than online. So I think that if you are having a really hard time then starting with something you love and pulling colors from it would be a better way to go. You can even have items color matched with a machine at most paint stores. So if there is a color in a fabric or something you love, you can have it matched and then use it as a starting point to go lighter or darker if you want to. I agree that finding a rug in person is really hard. I do most my rug shopping online now especially if the store offers free return shipping. Rugs are something you need to touch and see in person before you can make a good choice. Not sure if you have these 2 stores but my favorite in person stores to find rugs these days is HomeGoods and Living Spaces. Hope that helps! This was most helpful to me! You did an excellent job explaining something so complex to a layperson like me. Also, I love your color palette. Thanks a lot and keep up the writing! You are so welcome. This made my day, so thank you for the thank you! Hi Corey, this has been very helpful for choosing paint color for a new house are moving into next week. We are currently choosing carpet color for the upstairs of the house – family room area and bedrooms. Do you have any tips for choosing carpet color? Also, the downstairs has hardwood. The house is 140 years old, so it may be original, or added in the 50’s – not sure. Either way, we love hardwood. But I”m especially drawn to painted wood. I love your grey wood flooring. Would you recommend painting our wood floor, or let it be? Painting wood floors is quite a job and I would probably have a pro do it if it is something you decide to do. They will know how to get a lasting finish. As for carpet colors I would follow the same advice as the paint. When you are looking at carpet samples it is easier to tell (when they are right next to each other) which ones have more red, green, grey, blue, or brown undertones in them. 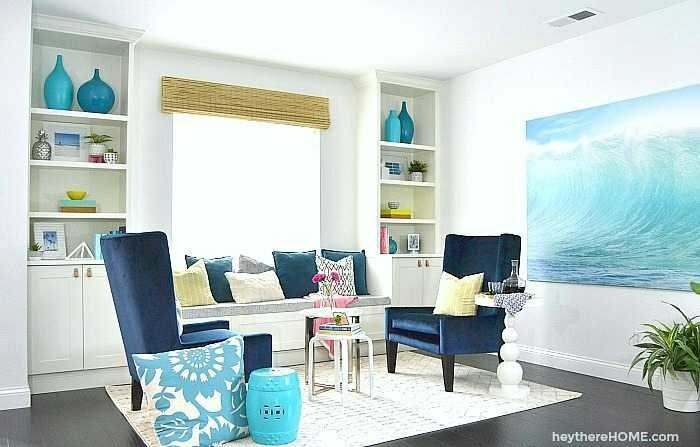 Depending on your color scheme stick with grey and brown undertones and go a bit blue if you like a cooler more modern/ stark space. Thanks for being here! Have a fantastic day! I pinned this a while back and it’s constantly being repinned so it feels like I’m thinking about this post constantly lol! I picked my color scheme similar to yours with greys and turquoise and pops of orange-y coral-y colors and I’m liking how it’s looking so far but every time I pick a new room to paint my husband is like… “let me guess… more grey” is it okay that the living room, hallway, bathroom & dining room are all grey? Should I be painting them all the same shade of grey or is it better to mix them up and go darker and lighter? My goodness I never thought this would be so hard! Hi Bree. My husband says the same thing. I think it is totally ok to do all the walls the same, but if you feel like it is too much you can do an accent wall in a color or even go up or down a shade of the grey you already have to give a little contrast. Beyond that you can change it up from one room to the next with your accent colors. Maybe have the main accent color be different in each space while still incorporating the same color palette throughout. Does that make sense? As I’ve looked in each room of my home, I’ve noticed a recurring color: green. And it so happens that green is my favorite color! In the bathroom that I’m trying to create, I’m drawn in by a light earthy color for the walls, with tiles with hints of green, with yellow as an accent color. What do you think of this color palette. I’m enjoying your blog! I think that sounds amazing and if that is what you are drawn to then definitely go for it. I like the idea of an earthy neutral and then bringing the green in in the tiles. Sounds so pretty! This is a great post! We bought our first house almost three years ago and went about painting rooms colors that we loved but that don’t really makes sense as a whole. I read somewhere that, especially with a smaller house (ours is about 1500 sq. ft). a unified color palette gives the illusion of space and I’ve noticed that it almost feels stressful to have each room be so different from each other. So now I’m slowly working my way through the house to bring each room more in line with our kitchen and living room (not that I need a good excuse to redecorate). 🙂 I love this post and all the tips about color. You cover a lot of material and make it sound doable! Saving this for reference. Thanks! This is exactly like the idea of what I’m aiming for (with some color changes) so this is SUPER helpful! I LOVE those stripey curtains though, do you remember where you found them? Hi Corey, I have enjoyed your post immensely! However I have a question for u . I’m redoing my house as well. We have an wfireplace with wall to wall built ins. It is painted swiss coffee which matches the double shears I already have and baseboards are the same colour. That being said we just painted the living room SW Collonade Gray which I thought was a light greige but in our living room at times is a gray-blue.I was a little disappointed because in my eyes its a little cool in colour but my husband loves it so it not changing any time soon. Our sofa and chair are cholate brown leather. In our entrance way I choose BM stardust 2108-40.on a very small accent wall. Our kitchen has white cabinets which I’m thinking of repainting as well. I’m trying to figure how to accent it now and what other colour to use throughout the house since I’m finding the Collonade Gray a bit hard can u give me any suggestions how to carry the colours through without repainting the whole thing? Hope this is all making sense to u and thank u so much ahead of time! I meant to tell you that the Swiss Coffee of the mantel is by Behr (a soft off white). A very soft ivory. I would also be interested in what you do with bedrooms. With the SW Collonade Gray there doesn’t seem to be a paint strip that I can go up or down with door the variations of colours you spoke of. Thanks again. Hi! I love your colors! would you be willing to share what the names are? I’m looking to paint my whole house. I’m most interested in your greige and light blue. Thank you!! I’m looking to paint my living room a similar gray to the one you have in yours. I want my main accent color to ben navy blue, so I’ll be choosing my gray from the blue base. My question is: Can I make this work with my light wood trim? The wooden staircase is next to the living room and it opens up to the fully wooden kitchen. I love my stairs and kitchen, so I think white will contrast too much. Can this color scheme be done effectively with wood instead of white? Absolutely although I would do your paint samples right up against the wood to be sure you like it. I think mixing cool tones with wood tones is a great way to make a space feel updated! Hi I love the colour palette you have used in your home. Would you share the names of the Sherwin Williams colours and then I can research a UK equivalent. Thank you for your intuitive explanations – I totally get it now. Love this! Thank you for a very detailed explanation of how to choose your house colors. Wondering what are you planning to do for bedroom and bathroom colors with your set house palette? Thanks for the post – I needed that… My idea was to be the absolutely coolest designer lady person in the whole world and paint one wall the deepest, darkest olive avocado forest-type dark green, and I really love it.. but the colors that make that green look best… ah – man. …why did I pick green? I’ll keep this posting available for the next bright idea I get. Help! Our entire house is painted brown! We are in the process of changing this, beginning with the kitchen and a little area next to it. We will have maple wheat cabinets & grizzly bay oak vinyl flooring. The backslash will be a combination of blue, silver and gray & a very light blue counter top. I’m thinking of going with a very light blue, (etheral white or blue bird day). But now I’m stuck. I like your posts on picking a main color, I jjust don’t know how. The living and dining room are connected. Both have dk browm furniture. Would it still be okay to paint those areas a very lt gray w\ blue under tones. I need the home to be a place of tranquility and calm. I’d be grateful for any suggestions. I love your color choices and was curious what the names of the colors are that you chose. Also, what about the tile you used? Thanks for any information! thanks a looooot for the pic of you r kitchen, you just fix my problem colors in one blink! I have exactly the same colors in my own kitchen but i could n t choose witch color put. Blue green, stay all grey and white?? I will choose a light green for the backsplash, i just love what you did! Hello. We went back and forth with the color for the back splash not wanting to be committed to color, but I’m so glad that we did a light blue because it adds just enough color to the area and I still love it 5 years later. Thank you for this site! Your style is very similar to mine, so I find your sharing of your colors very helpful. I’m remodeling my home, starting with the master bathroom. I found that I had to sort of decide on color based on what tiles I liked (and could afford!). I ended up going with a dark gray and a light gray. My cabinets are white. I haven’t picked a countertop yet. I’d love to see pics of your bathroom to see what you did. Thanks so much for sharing!! Great advice! Thanks for this! We just bought a home, and I hadn’t the slightest idea where to start. This helped a lot! I’m having a challenge though. I grew up in a log cabin, so I like wood a lot (and there are hardwood floors and wood paneling above the fireplace), and my husband loves red, so we have tons of little red accents in our current place, but we both prefer a harmonious color scheme and lean towards blues and greens and greys. Is it possible to have both? Also, we have a lot of light and windows. Any tips on how to help it feel connected with the outdoors? HI! I was wondering if you could share the color of gray that you used as the main color. It is very pretty! It is requisite grey by Sherwin Williams but I had it mixed (color matched) at Home Depot. I absolutely love your home ,those are the exact colors I would want. Do I have those no but how do you turn your house around and start over? My colors are more of the green burgundy brown tan. It’s hard to give up all the stuff you have already to change out, so where do you start? Thank you so much!!! That is a great question. 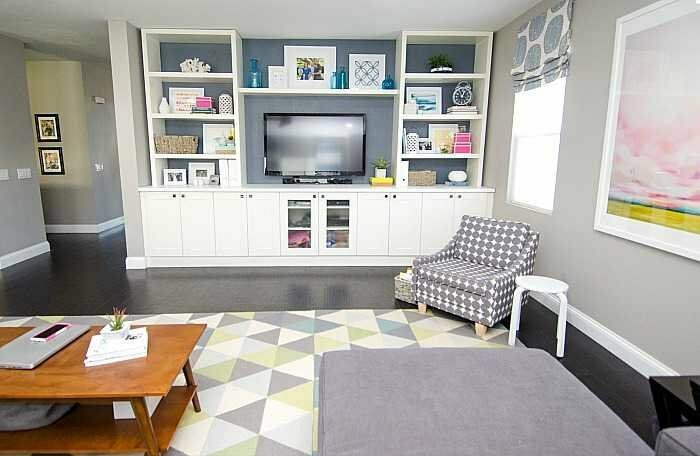 I think starting with wall color is a great place to start and then if you can afford to replace any of the staple items like a sofa, start there too. Once you have those in place it is just a matter of making some of the items that you already have work with your space. You can always change the color of something (like a large piece of furniture) with paint. Then add your pops of color a little bit at a time with things like pillows, curtains, and accessories. It doesn’t all have to happen at once, but if you have an idea of what you are working toward you can make small purchases or tweaks a little bit at a time. I love reading about how you decorate your home! I am trying to find a color palette that is very similar to yours, but the blues I am bringing home just aren’t right. Could you share the name and brand of the colors you chose? Thank you so much! Hi Karen. I’ve been getting a lot of requests for a list of the colors I use lately and I need to get out in the garage and dig through my paint and make a list. I think I’ll just put it in a post next week and I’ll let you know when it is up so you can take a look. Blues can be really hard cause you don’t want a light blue to come off as being a nursery. Hahaha (although I do love nurseries!) I’ll be in touch! Hi! Just stumbled on this and I am looking for a cute cheap chevron rug and I saw your teal one. I was wondering where you got it? Thanks! Hi Kristen. I found it on overstock about 2 years ago. It was only about 110 bucks so definitely worth checking there. It isn’t plush, but it adds the shot of color I needed. This was incredibly helpful! Saving it for the future, when we are ready to redo our decor. Thank you! Finally someone who speaks my language! So glad I found this from Pinterest! I’m in my forever house and have great paint colors but I need to come up with a plan for new colors in the future. Your information should help a ton! Glad I found this BEFORE I painted! Hi Anne! I’m so glad you found me too and I’m happy that the info helped. Just shoot me an email if you ever have any questions! Hi Christine! Congrats on your big project! I have really dark floors and they DO show every single spec. I would not do really dark again. Instead I would go with a medium wood tone that is more of a pure brown (with black or grey undertone, not orange.) As for the two tone cabinets, I have white cabinets with a dark grey quarts countertop and our island is a dark wood cabinet with a white (mistey carrera) quarts countertop. I love how it breaks everything up. I’m a big fan of white cabinets, but I do think that painted cabinets can look nice too as long as they are done well. I personally don’t love a ton of wood tones so that is why the more solid color cabinets work for me. I just recently discovered a wall color that might just be my favorite ever. It is pretty light, but will still make your moldings pop and is a perfect greige neutral. It is called “loop” by frazee, but you can tell the people at Home Deopt and they can have it color matched for you if you don’t have a Frazee near you. I just redid my aunt’s master suite and used this color and it is beautiful. Anyway, I hope this all helps. Let me know if you have any more questions! THanks so much for being here! Thank you so much for this article – plus your posts on finding right greige. I feel like I have a MUCH better understanding of what to do. We will be finishing a rebuild soon and I am working on our color pallate. This is so timely. Side note… where did you find your glass subway tile in your kitchen? It’s gorgeous. Love your ideas and colors! Can you tell me the brand/names of the colors you used? I’d like to incorporate them in my house. Thanks! Your home is beautiful and this post has been the greatest decorating help that I have found on the web. I have a better idea of how to start decorating and making purchases for our brand new home. I am starting to see how the colors I was already using at our previous residence “fit” the 5 color types you’ve explained. My follow up question goes along with your great inclusion of your pictures of your rooms and the descriptions of how the colors are working in those spaces. Do you have a recommendation of how much of each one of the five color types to use? For example, I noted in your living room that the the white (1) showed up on pillows, accents, decorations, and window treatment; neutral (2) was your wall color; the saturated color (3) is on the windows treatment and some decorations; the another color (4) is on the pillows and some decorations; and the accent color (5) is on the decorations. It may be too mathematical, but I read a similar type post that had percentages like 10% of the room is should be the accent color and so forth. However, I did not like that blogger’s style as much as I like yours and I am interested in HOW you know how much of each color type to use in the room. I understand that the percentage of each color type will change room to room but do you have a general guide (even just a natural eye for amounts) for one color should be about 50%, one 30% etc? Maybe in one room the white is 50% and in another the neutral is 50% but each room should be about 50, 30, 10, 5, 5 for example (Clearly I made that formula up. I have no idea what I’m talking about, I am just trying to explain what I am trying to ask!). I don’t want to end up with too much of one color or too much of all the colors in any of the rooms. I hope my crazy question makes some sense! Hi! I loove this, it’s just beautiful. I am in love with the kitchen backsplash tiles…can you give me more info on them? Hi Kelly! We did our kitchen ourselves about 5 years ago and it was the best sweat equity we have put into our home. 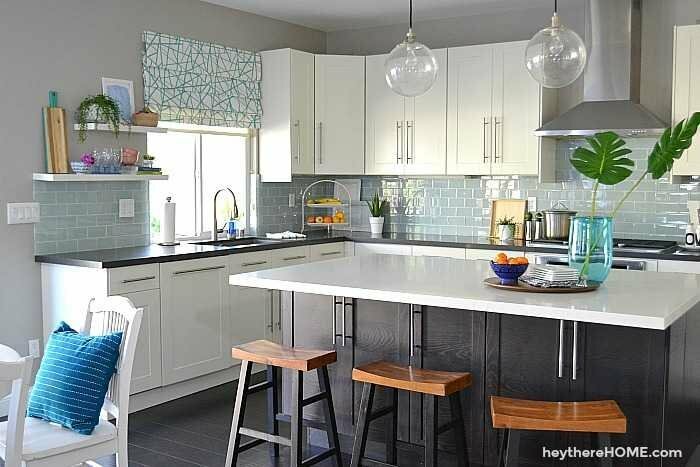 The backsplash is glass subway tile in a really light blue color. I bought them online at Anchor Blue Tile, but I think you can find them at many tile stores. They are a standard 4×6. The key with glass tile is to use sandless mortar and grout so that you don’t see all of the grainy stuff through them when you put them on the wall. Anyway, I was toying with doing an all white kitchen and I’m so glad I added just a hint of subtle color to the space! Let me know if you have any more questions. Thanks for stopping by! We recently purchased a fixer-upper, and gutted it down to the studs! So, this is the first time that I have complete say in what goes in, what colors and materials are used, etc. It’s overwhelming – but lots of fun! Though I picked the color scheme before finding your blog, I used a similar system – and couldn’t be happier with it. I chose to limit the main colors to two complimentary neutrals (a gray and a tan), with white trim throughout. Then, I chose an accent color of a very light, muted aqua. I used the accent color throughout the house, tying all the rooms together. It’s muted and classy, and feels so “put-together”! Love your blog — will definitely be checking back for more ideas! This is such a great post! Thank you! Can you tell me what greige you ended up with in this color pallet? My husband and I just moved into a 100 year old house with lots of quirks (the kitchen has a trap door!). I have tried 9 different greys/beige/whites for our kitchen and none of them are “the one”. The kitchen has 5 big windows, so tons of light. The floors are REALLY old black & white checkered laminate….and it’s not in the best condition. The cabinets are stark white and will eventually be replaced. Right now I feel like everything I try looks dingy or too dark. Repose Grey has been a favorite, but I worry it’s just a hair too dark. I lean towards warmer tones, especially because we have a lot of antique wood (there is a 1930 Hoser Cabinet that functions as our pantry). Would love some input! Our family room is a main walk through area of the home from the large patio to the kitchen/everywhere else in the house. We were thinking of putting in a dark brown-gray varied carpet because DH MUST have wall to wall carpet in the family room (no wood floors), and I don’t want to see every stain on it. While the kitchen cabinets will be white, I really want to have a natural wood dining table (which will be either maple or cherry), and I don’t know how to reconcile multiple wood colors in the house along with beige tile. Will too many colors of brown break up the seamless feel of the house? My colors are aquamarine with a pop of orange. The kitchen cabinets and trim will be white with a yellow undertone in the open family/dining/kitchen area. Any suggestions? Thank you so much for sharing your insight and experience with us! We just purchased our first single family house and I want to paint the entire house; however, the paint choosing process has me frustrated and frozen! I know that I love gray-tan wall colors but haven’t been able to figure out how to make it flow through my open floor plan. Your post has given me a better idea of how to make it flow…thanks! My only problem is that I don’t know what my 2nd color should be, but I do know that I like orange and yellow as accent colors. I think I’m leaning towards dark blues and turquoise, but I also like deep greens. My family room couch is a midnight blue and the wall color will be Revere Pewter. Any additional insight you may have would be greatly appreciated! Thanks again! Wow,Wow wow!!! I found this site at the right time. I have been in our house for over twenty years and so it is time to update. You have made this process so much easier & better!! Thank you! I have white trim, white cabinets and brown & beige everywhere. I love the browns, but would like to switch to the greys or greige!!! I have a first floor plan that is a circle. You walk into the entry way that goes into the first floor as well as go up the stairwell to the second floor. to your immediate left is the living room that flows into the dining room that then goes into the kitchen with then a family room and back into the hall way. I have brown furniture, oak floors with beige carpet. So trying to find a color that goes with the different browns is a challenge. I love the white trim and want to keep the cabinets white too. Thank you for your time and much needed help!!! We have dark wood cabinets and trim. I would love to paint our trim white but my husband says NO WAY! (We just built our house 4 years ago and he hates white trim- he did let me put it the basement so that was our compromise.!). Anyway- we built and just went with a tan color. I’m very sick of the tan. I want something light and bright, but everything I see online is paired with white trim and I’m afraid it will look washed out with our dark trim/cabinets (very open floor plan). Soooo help!! Hi Chelsea! I’d love to help. I do have a question though. When you say dark trim do you mean with a red or a brown undertone. That will help guide me in a direction. In fact if you could send me a photo to [email protected] I could see first hand what you are needing to design around. Hope to hear from you soon! I love the colours that you ave chosen! What are the paint colours on your walls? 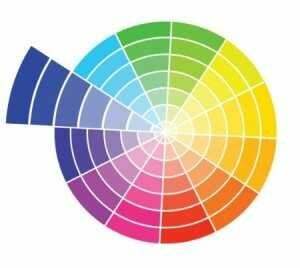 This is the most clear description I’ve ever read about how to apply color theory to a home! Thank you so much for sharing…And while all homes are “a work in progress” yours looks absolutely amazing! I love the cooool blue tones. Gorgeous! Thanks for sharing at the show and tell tuesday link up! have a great week! You have a beautiful and inviting home – Kudos. Thank you so much for sharing your well thought-out color plan. I LOVE this!!! Also, that sectional is to die for + is exactly what we are looking for! Any idea where you got it? Hi Carmen! I’m thrilled that you found this post useful. We got the sectional at a local furniture place where they do knockoffs of places like Crate & Barrel and Pottery Barn. They are typically found in industrial warehouses. I’m in San Diego and this one in particular is called Roomers but when I lived up north there was one there too. I found about it through word of mouth, so start asking around and I’m sure someone will know of one. What is cool about these places is that you get a really good price but you can typically customize dimensions too. Have a great weekend! Love your house..looks like it belongs in a home decorating magazine!..absolutely beautiful…thanks for all the helpful tips..ready to pick paint colors! Hi Jamie! I’m so glad you found this post useful. It was fun to write cause I really had to think about the process that is selecting colors. Hope you have a fun filled weekend ahead! This is absolutely brilliant!!! Will definitely be putting this to work as I start on my own home!